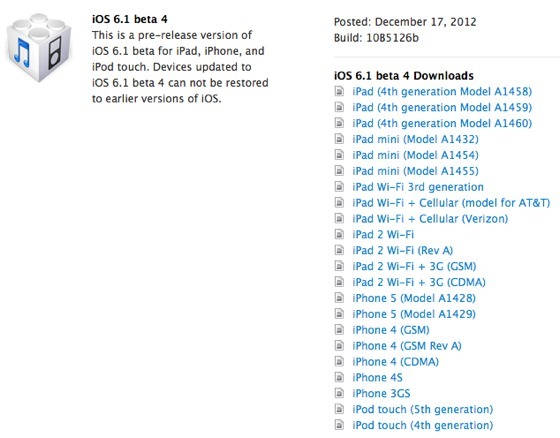 iOS 6.1 Beta 4 has been released to developers registered with Apple’s iOS Dev program. The 4th beta release of iOS 6.1 is build 10B5126b, and is now available to download through OTA update on devices already running existing 6.1 betas. As usual, IPSW firmware files are also available to download directly from the dev center. Compatible devices continue to be the iPad 2, iPad 3, iPad 4, iPad mini, iPhone 3GS, iPhone 4, iPhone 5, and the iPod touch 4th and 5th gen. There does not appear to be any significant change, and iOS 6.1 is expected to be an incremental update with bug fixes and improvements to Apple Maps, Passbook, Siri, and Safari. Some minor user interface changes have also been noticed by those using the developer builds. There is no projected release date for when iOS 6.1 will be available to the public, but the beta releases are progressing along at such a rate that we could see a release within the next few weeks. An ongoing thread at MacRumors has specific discussion on the changes for those who are interested.